Participating in the annual Festin Neuchâtelois means to be feasting for hours on a four course meal highlighting local products from the canton of Neuchâtel. That's a mouthful! If you have a passion for learning about Swiss food specialties, I recommend a visit to the canton of Neuchâtel for a remarkable feast. In its third year, Festin Neuchâtelois has thirteen different restaurants participating throughout the region. On Sunday, March 8, 2015, each location will serve a meal designed to highlight over a dozen regional dishes, giving you the chance to sample a variety of local foods - all in one afternoon. My interest in Swiss-French cooking led me to attend the first-ever Festin Neuchâtelois in 2013. I discovered many traditional foods, some of which I have recreated in my home kitchen. Like Saucisson neuchâtelois, and most recently Bricelets sucrés. In contrast, the memorable Gelée de pied de veau (calf's foot jelly) was not my favorite dish, but was still fun to try. Bring an open mind - and an empty stomach! 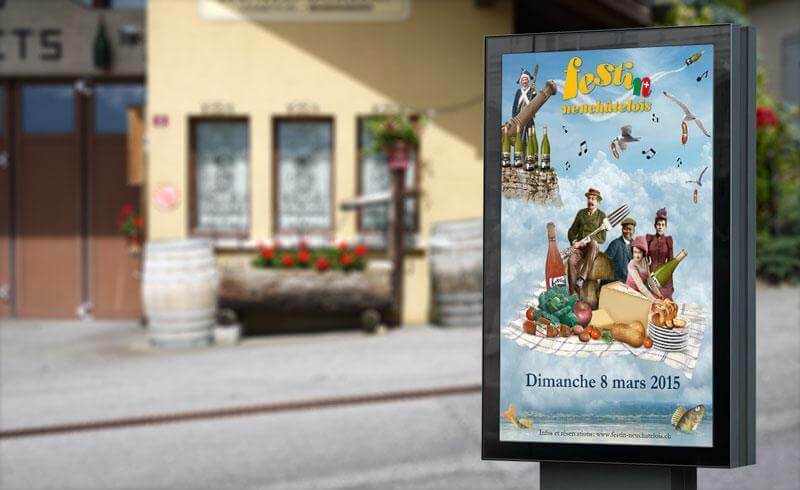 GastroNeuchâtel, the cantonal association for hotels and restaurants, developed Festin Neuchâtelois in an effort to help support and promote local food products and restaurants. The event brings people together to celebrate the rich culinary history and expertise in Neuchâtel. Altogether, the participating restaurants represent five different districts within the canton: Boudry, Le Chaux-de-Fonds and Le Locle, Neuchâtel, Val-de-Ruz and Val-de-Travers. • delicious regional cheeses, like Bleuchâtel, Britchon and Tomme Neuchâteloise. You can try all of these dishes (and more) at this year's Festin Neuchâtelois. Why not pair them with local wines from Neuchâtel area vineyards, such as with Chasselas and Pinot Noir? Similar to the traditional Swiss feasts of La Bénichon in Fribourg and La Saint-Martin in the Jura, Festin Neuchâtelois showcases regional cuisine in a festive atmosphere. It represents food, community and great hospitality, creating a culinary experience in the canton of Neuchâtel that you will not forget very soon (and you will be so full that you may skip breakfast the next morning — at least that's how I felt!). - When: Sunday, March 8, 2015, beginning at noon (Please note: When I attended Festin Neuchâtelois in 2013, the meal lasted for about six hours. If you would like an estimate of when this year's meal will end, I suggest contacting the individual restaurants). - Where: The special four-course meal will be served at thirteen restaurants in the canton of Neuchâtel. Locations vary, as some have rural settings, like La Ferme des Brandt, while others have more urban and formal settings, like Hotel DuPeyrou or La Maison du Prussien.